The Nor'easters are ranked as high as 16th in preseason polls. BIDDEFORD — Over the years, the NCAA Division III landscape in Maine has featured some of the top women’s basketball teams not only in New England, but the nation. And leading the group has usually been the University of Southern Maine or Bowdoin College, two programs full of NCAA tournament success. This year, however, the state has another standard-bearer. And that would be the University of New England. The Nor’easters, who return all five starters from a team that was 27-3 a year ago and advanced to the second round of the NCAA tournament for the second consecutive winter, are the only Maine school ranked in the top 20 in both of the preseason polls. UNE is ranked 20th in the D3hoops.com poll, 16th in the USA TODAY poll. (Bowdoin is ranked 22nd in the D3hoops.com poll and received votes in the USA TODAY poll; USM received votes in both polls). UNE’s rise shouldn’t be surprising. 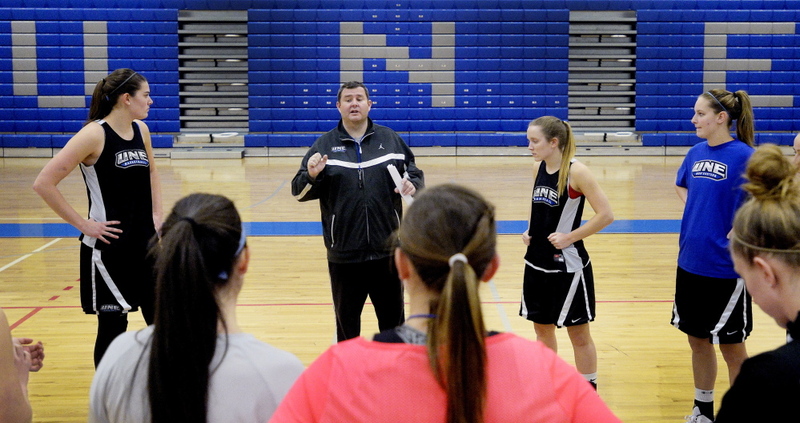 Since Anthony Ewing took over as the Nor’easters’ coach in 2007, UNE has steadily progressed, earning four NCAA tournament berths in seven years. UNE’s win totals under Ewing have gone from 13 to 20 to 23 to 24 to 22 to 25 to 27. Ewing, a native of Portland, credits the success to what the players have done. “I’m just the guardian of the gate,” he said. Well, he’s got some pretty good players returning this year. The returning starters are led by senior forward Kelly Coleman of Portland, Connecticut (17.1 points, 7.1 rebounds), junior guard Lauren Hayden of Chantilly, Virginia (Commonwealth Coast Conference defensive player of the year) and Gribbin (8.7 points, 3.5 assists). All three were conference all-stars last year. Junior guard Sadie DiPierro of South Portland (McAuley) and sophomore 6-foot-3 center Alicia Brown of Greenland, New Hampshire, are also returning starters. Junior guard Alanna Vose of Cushing (Medomak Valley) and sophomore forward Brooke Flaherty of Portland (Cheverus) round out the returning top seven scorers from last year. But this team will always rely on its defense to win games. Last year the Nor’easters allowed an average of 52.6 points per game while scoring 66.6. “We really do commit to playing defense for 40 minutes,” said Ewing. “The kids know that. The kids know if they’re not playing defense, they’re not going to be out there. So we will play defense for 40 minutes. “We do have kids who can shoot it. We’re really strong in the low post and we have kids who can break you down off the dribble. They have lofty goals, according to Ewing. “Our goal is to get back and go further,” he said. “We’re not afraid to say that. UNE will learn a lot about itself in the next week. The Nor’easters play at USM on Wednesday, then host Bowdoin next Tuesday. And unlike years past, they’ll have the big expectations on their backs. Three starters return from a team that won 21 games and advanced as far as the first round of the NCAA Division III tournament before being upset by Castleton State. This year’s squad could be better. “I think our balance, our depth and our versatility will be our strengths this year,” said Coach Adrienne Shibles, in her seventh year at Bowdoin. Returning starters include senior guard Sara Binkhorst of West Hartford, Connecticut, junior forward Shannon Brady of Scituate, Massachusetts, and sophomore guard Marle Curle of Plattsburgh, New York. The 6-foot Brady, who averaged a team-high 14.1 points and 7.1 rebounds, and Binkhorst, who averaged 13.1 points and 2.5 assists, were both honorable mention all-America selections. Senior forward Megan Phelps of Southwest Harbor (Mt. Desert Island) averaged 9.6 points and 6.4 rebounds last year. Shibles said everyone is going to get playing time. Sophomore forward Emily Campbell of York, sophomore guard Sydney Hancock of Casco (Lake Region), freshman forward Lydia Caputi of Brunswick (Tabor Academy) and freshman guard Hannah Cooke of Portland (The Berkshire School) will all benefit from that rotation. With eight freshmen on his roster, Mike McDevitt has had to temper his expectations a little bit this year. Not that the Monks won’t be competitive, it just might take some time to get there. The Monks won 23 games last year, won the Great Northeast Athletic Conference championship and lost in the first round of the NCAA Division III tournament. Morgan Cahill, a 6-foot junior center from Yarmouth, is the only returning starter. She led the Monks in scoring (15.3 points) and rebounding (8.0) last year. She and senior point guard Sarah Assante of Standish (Bonny Eagle) are co-captains. Assante was second on the team in assists and steals last year. There are some other players returning who received significant playing time last year: sophomore guard Abbie Eastman of Norway (Oxford Hills), sophomore forward Molly Mack of Portland (McAuley) and sophomore guard Emily Kehoe of Lebanon, New Hampshire. The Monks have won their first two games this season. After winning 19 games and losing in the Yankee Small College Conference semifinals a year ago, the Seawolves have loftier goals. SMCC has opened with a 3-3 record, winning its only conference game last weekend, 108-53 over Vermont Tech. They have a young team, with eight freshmen on the roster. But those first-year players are all contributing. Amira Jones, a 5-10 center from Chicopee, Massachusetts, is the Seawolves’ leading scorer (13.5 points per game) and rebounder (10.8) while perimeter players Kendra Kagiliery of Kittery (Traip Academy) and Samantha Griffin of Union (Medomak Valley) are each hitting over 40 percent of their field-goal attempts. SMCC has decent height with a couple of 6-footers in freshman Jennifer Genthner of Newcastle (Lincoln Academy) and junior Alicia Hoyt of Steep Falls (Bonny Eagle), who is returning from ACL surgery. The Huskies have won at least 20 games in 33 of the previous 34 seasons. This year shouldn’t be any different, except that they want more. USM’s season ended abruptly last year in the Little East Conference championship game. Even with a 20-8 record, it wasn’t selected for an at-large bid in the NCAA Division III tournament. This year the Huskies are looking for more. “I think we’re going to be decent, if we get healthy,” said Coach Gary Fifield, in his 27th year. The Huskies are led by senior co-captains Rebecca Knight of Alfred (McAuley) and Stephanie Gallagher of York. Knight averaged 9.9 points and 6.7 rebounds last year, while Gallagher hit 36 percent of her 3-point attempts. Other key returning players include senior guard Taylor Flood of Sanford, junior forward Megan Pelletier of Winslow (Messalonskee), junior forward Ella Ramonas of Portland (Deering, and a transfer from Barry University) and senior guard Lauren Rousseau of Biddeford.